After the overwhelming participation in CXA Airdrop Round #1. 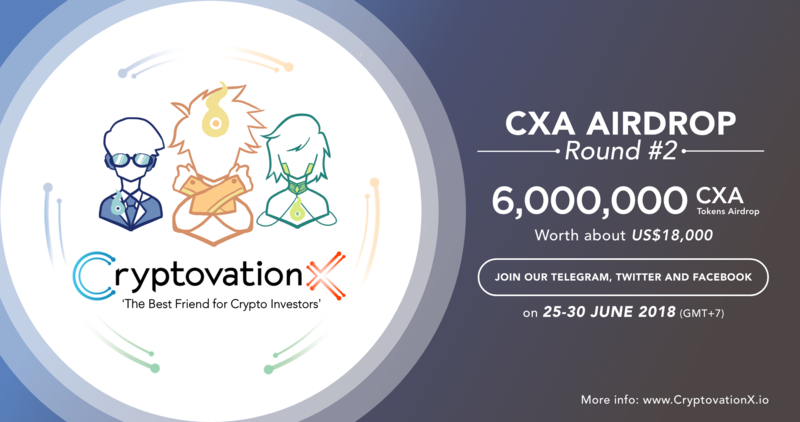 It’s great pleasure to announce CXA Airdrop: Round #2 after our CXA Airdrop: Round #1 had finished successfully in 48 hours with more than 10,000 telegram joiners. The total 3,000,000 CXA tokens will be distributed to every each Airdrop participant equally. When the number of Telegram joiners reach 30,000 members, we will giving another 3,000,000 CXA tokens as an extra bonus for Round #2 to express our appreciation and thankfulness to all participants. These tokens can be used to ‘unlock’ future features of the CryptovationX robo-advisory platform and will be a powerful mechanism in the robo-advisory platform, you may want to hold them. The CryptovationX robo-advisory is a limited version of the robot made exclusively to participants in the Airdrop and only available for existing CryptovationX Community members. Besides receiving CXA tokens, Airdrop participants will get an exclusive first-look at the CryptovationX robo-advisory platform before its official public launch. 3. All rewards will be credited into your ETH wallets in JUNE. We will kindly ask you to indicate the address of the wallet that is compatible with ERC20 token standard, such as MEW, Metamask, and other major ETH wallets. CryptovationX was established by Cryptovation and two major collaborators AVA Advisory and Asia Wealth Group. It aims to assist crypto investors by utilizing artificial intelligence (AI) to build a “best of breed” robo-advisory platform for digital asset investment. The project will develop iOS and Android mobile applications equipped with six basic features and three robo-advisory functions including Arbi (Arbitrage trading), Specto (Speculative trading), and Broca (ICO investment). Cryptovation X also aims to assist in solving socio-economic problems such as education, unemployment and poverty by implementing a corporate social responsibility initiative with two strategies: 1) Financial Education Mechanism - a program that allows everyone to become an analyst (“Predictor”) and be compensated for so doing, together with a grant to support other social organizations and 2) Blockchain x AI Ecosystem - a program that encourages R&D and knowledge sharing about the ecosystem, through.